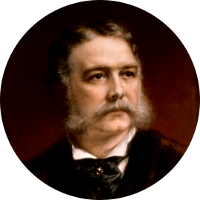 President Chester Alan Arthur was born 5 October 1829 in Fairfield, Vermont, to William Arthur and Malvina Stone. His father William Arthur was a preacher that had come to the United States from Ireland. He married Ellen "Nell" Lewis Herndon in 1859 at the Calvary Episcopal Church in New York. He was known as "The Gentleman Boss" and was elected as Vice President in 1880. He became the 21st President of the United States when President Garfield was assassinated in 1881. President Garfield's assassin shot him specifically in order to make Chester Arthur the President. Chester Arthur finished President Garfield's term but failed to win his party's nomination in 1884 and was thus held to only one term. Among President Arthur's famous relations was Captain William Lewis Herndon, his wife's father. Captain Herndon gained fame in 1857 when he commanded the sidewheel steamer S.S. Central America on her final voyage. Carrying well over $2 million dollars in freshly minted $20 gold double eagles from the San Francisco Mint, the ship sank in a hurricane on 12 September 1857. Due to the efforts of Captain Herndon and his crew, at least 153 or the 400 passengers and crew aboard survived, including all the women, and all but one of the children. At the end, Captain Herndon, in full uniform, is said to have stood calmly at his post in the wheel-house as the ship went under. During the 1980s, the shipwreck would be discovered and over the gold, with a numismatic value of over $100 million, would be recovered. A couple of notable ancestors of President Arthur include John Proctor Jr. and Susanna (North) Martin. Both were accused and convicted of witchcraft during the Salem Witch Trials in 1692. Both were among those executed that summer.